Way, way back when (really just 20 years ago), before he made Scott Pilgrim or Hot Fuzz or Shaun of the Dead, wee little Edgar Wright made his first film at the "tender" age of 20. 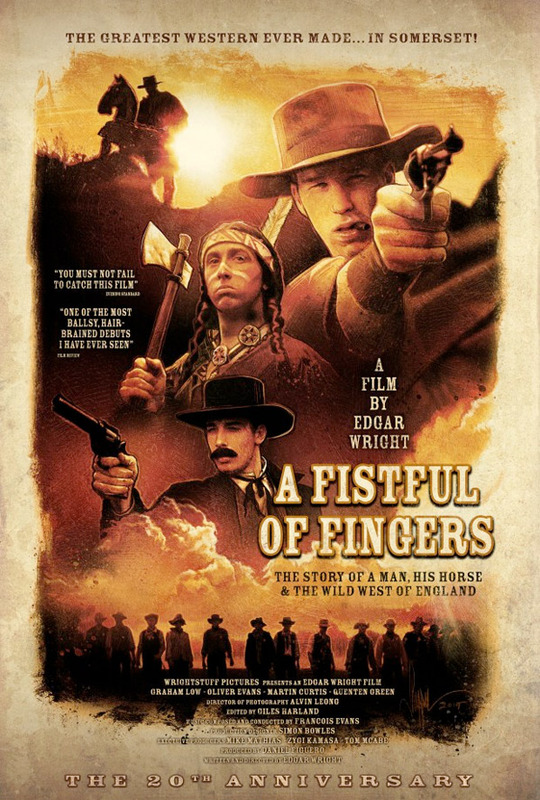 It's a goofy western called A Fistful of Fingers (referencing Sergio Leone's A Fistful of Dollars), and it runs only 78 minutes, featuring mostly Wright's friends. When this was brought up during the release of The World's End, Edgar realized that the film was barely released and not many people have ever actually had the chance to see it (though it did hit the web a few years ago). Now it's getting a 20th anniversary re-release in London this November, and it's opening next month on the big screen with a premiere at Cinefamily in Los Angeles. Check it out. The poster above was created by Paul Shipper to celebrate the upcoming release/premiere of the film in the US. It's also re-opening in London at the legendary Prince Charles Cinema starting on November 24th. The film follows Graham Low (the living statue in Hot Fuzz) in the lead role as “No-Name”, a gunslinger who rides into Somerset aka Deadwood Town in search of his rival The Squint (Oli van der Vijver). After the death of his loyal horse Easy, No-Name swears revenge and sets off to settle the score once and for all. Unlike the work which has made Wright a praised filmmaker, A Fistful of Fingers is a straight-up parody along the lines of Monty Python and the Holy Grail, Airplane! or The Naked Gun. Edgar Wright made this film on 16mm, and jokes "I'm not going to say it's good as Citizen Kane but it is a hell of a lot sillier." Yep.